For the ancient capital of Boeotia, see Thebes, Greece. For other cities called Thebes, see Thebes. Thebes (Ancient Greek: Θῆβαι, Thēbai), known to the ancient Egyptians as Waset, was an ancient Egyptian city located east of the Nile about 800 kilometers (500 mi) south of the Mediterranean. Its ruins lie within the modern Egyptian city of Luxor. 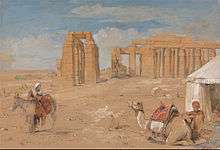 Thebes was the main city of the fourth Upper Egyptian nome (Sceptre nome). It was close to Nubia and the eastern desert, with their valuable mineral resources and trade routes. It was a cult center and the wealthiest city of ancient Egypt at its heyday. 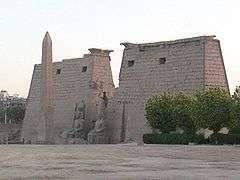 The site of Thebes includes areas on both the eastern bank of the Nile, where the temples of Karnak and Luxor stand and the city proper situated; and the western bank, where a necropolis of large private and royal cemeteries and funerary complexes can be found. 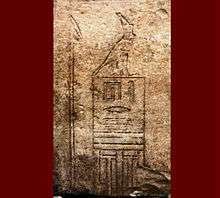 The Ancient Egyptians originally knew Thebes as Wo'se or Wase A was was the scepter of the pharaohs, a long staff with an animal's head and a forked base. From the end of the New Kingdom, Thebes was known in Egyptian as Niwt-Imn, the "City of Amun". Amun was the chief of the Theban Triad of gods whose other members were Mut and Khonsu. This name appears in the Bible as the "Nōʼ ʼĀmôn" (נא אמון) of the Book of Nahum and probably also as the "No" (נא) mentioned in Ezekiel and Jeremiah. In the interpretatio graeca, Amun was seen as a form of Zeus. The name was therefore translated into Greek as Diospolis, the "City of Zeus". To distinguish it from the numerous other cities by this name, it was known as the Great Diospolis (μεγάλη Διόσπολις, megálē Dióspolis; Latin: Diospolis Magna). The Greek names came into wider use after the conquest of Egypt by Alexander the Great, when the country came to be ruled by the Macedonian Ptolemaic dynasty. 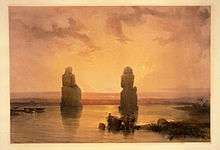 Thebes was located along the banks of the Nile River in the middle part of Upper Egypt about 800 km from the Delta. 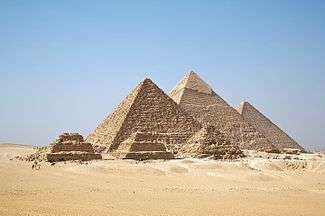 It was built largely on the alluvial plains of the Nile Valley which follows a great bend of the Nile. As a natural consequence, the city was laid in a northeast-southwest axis parallel to the contemporary river channel. 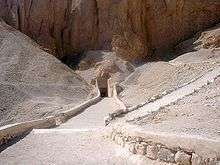 Thebes had an area of 93 km2 (36 sq mi) which included parts of the Theban Hills in the west that culminates at the sacred 420-meter (1,378-foot) al-Qurn. In the east lies the mountainous Eastern Desert with its wadis draining into the valley. Significant of these wadis is Wadi Hammamat near Thebes. It was used as an overland trade route going to the Red Sea coast. By 2160 BC a new line of pharaohs (the Ninth and Tenth Dynasties) consolidated Lower Egypt and northern parts of Upper Egypt from their capital in Herakleopolis Magna. 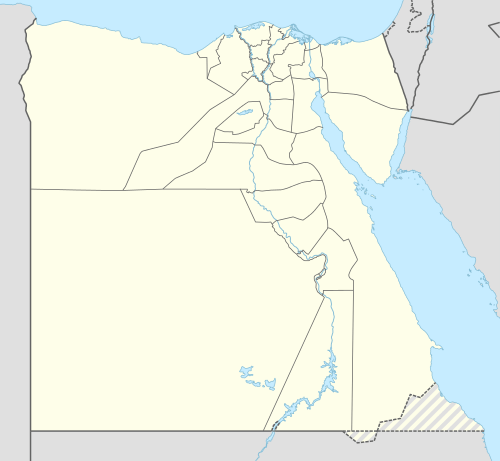 A rival line (the Eleventh Dynasty) based at Thebes ruled the remaining part of Upper Egypt. The Theban rulers were apparently descendants of the prince of Thebes, Intef the Elder. His probable grandson Intef I was the first of the family to claim in life a partial pharaonic titulary, though his power did not extend much further than the general Theban region. Theban princes (now known as the 16th Dynasty) firmly stood over their immediate region as the Hyksos advanced from the Delta southwards to Middle Egypt. The Thebans resisted the Hyksos' further advance by forming an agreement for a peaceful concurrent rule between them. The Hyksos were able sail upstream past Thebes and some Nile cataracts to trade with the Nubians and the Thebans brought their herds to the Delta without adversaries. The status quo continued until Hyksos ruler Apophis (15th Dynasty) insulted Seqenenre Tao (17th Dynasty) of Thebes. Soon the armies of Thebes marched on the Hyksos-ruled lands. Tao died in battle and his son Kamose took charge of the campaign. After Kamose's death, his brother Ahmose I continued till he captured Avaris, the Hyksos capital. Ahmose I drove the Hyksos out of Egypt and the Levant and reclaimed the lands formerly ruled by them. With Egypt stabilized again, religion and religious centers flourished and none more so than Thebes. For instance, Amenhotep III, poured much of his vast wealth from foreign tribute into the temples of Amun. The Theban god Amun became a principal state deity and every building project sought to outdo the last in proclaiming the glory of Amun and the pharaohs themselves. Thutmose I (reigned 1506-1493 BC) began the first great expansion of the venerated Karnak temple. After this, colossal enlargements of the temple became the norm throughout the New Kingdom. Queen Hatshepsut (reigned 1479-1458 BC) made the Theban economy flourish by renewing trade networks, primarily the Red Sea trade between Thebes' Red Sea port of Al-Qusayr, Elat and the land of Punt. Her successor Thutmose III brought to Thebes a great deal of his war booty that originted as far as Mittani. The 18th Dynasty reached its peak during his son Amenhotep III's reign (1388–1350 BC). Aside from embellishing the temples of Amun, Amenhotep increased construction in Thebes to unprecedented levels. On the west bank, he built the enormous mortuary temple and the equally massive Malkata palace-city which fronted a 364-hectare artificial lake. 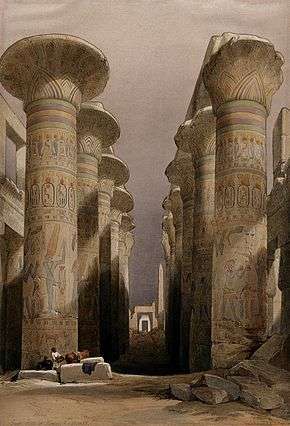 In the city proper he built the Luxor temple and the Avenue of the Sphinxes leading to Karnak. With the 19th Dynasty the seat of government moved to the Delta. Thebes maintained its revenues and prestige through the reigns of Seti I (1290–1279 BC) and Ramesses II (1279–1213 BC), who still resided for part of every year in Thebes. Ramesses II carried out extensive building projects in the city which include enormous statues and obelisks, the third enclosure wall of Karnak temple, additions to the Luxor temple, and the Ramesseum, his grand mortuary temple. The constructions were bankrolled by the large-scale granaries (built around the Ramesseum) which concentrated the taxes collected from Upper Egypt; and by the gold mining expeditions to Nubia and the Eastern Desert. Under Ramesses' long 66-year reign, Egypt and Thebes reached an overwhelming state of prosperity which equaled or even surpassed the earlier peak. The city continued to be well-kept in the early 20th Dynasty. The Great Harris Papyrus states that Ramesses III (reigned 1187–56) donated 86,486 slaves and vast estates to the temples of Amun. Ramesses III received tributes from all subject peoples including the Sea Peoples and Meshwesh Libyans. Egypt as a whole, however, was experiencing financial problems, that even reached Thebes' village of Deir el-Medina. In the 25th year of his reign, workers in Deir el-Medina began striking for pay and there arose a general unrest of all social classes. Consequently, an unsuccessful harem revolt led to the deaths of many, including Theban officials and women. Under the later Ramessids, Thebes began to decline; the government fell, it seems, into grave economic difficulties. During the reign of Ramesses IX (1129–1111 BC), about 1114 BC, a series of investigations into the plundering of royal tombs in the necropolis of western Thebes uncovered proof of corruption in high places, following an accusation made by the mayor of the east bank against his colleague on the west. The plundered royal mummies were moved from place to place and at last deposited by the priests of Amun in a tomb-shaft in Deir el-Bahri and in the tomb of Amenhotep II. (The finding of these two hiding places in 1881 and 1898, respectively, was one of the great events of modern archaeological discovery.) Such maladministration in Thebes led to unrest. Control of local affairs tended to come more and more into the hands of the High Priests of Amun, that during the Third Intermediate Period, the High Priest of Amun exerted absolute power over the South, a counterbalance to the 21st and 22nd Dynasty kings who ruled from the Delta. Intermarriage and adoption strengthened the ties between them, daughters of the Tanite kings being installed as God’s Wife of Amun at Thebes, where they wielded greater power. Theban political influence receded only in the Late Period. The good relationship of the Thebans with the central power in the North ended when the native Egyptian pharaohs were finally replaced by Greeks, led by Alexander the Great. He visited Thebes during a celebration of the Opet Festival. In spite of his welcoming visit, Thebes became a center for dissent. Towards the end of the third century BC Hugronaphor (Horwennefer), possibly of Nubian origin, led a revolt against the Ptolemies in Upper Egypt. His successor Ankhmakis, held large parts of Upper Egypt until 185 BC. This revolt was supported by the Theban priesthood. After the suppression of the revolt in 185 BC, Ptolemy V, in need of the support of the priesthood, forgave them. Half a century later the Thebans rose again, elevating a certain Harsiese to the throne in 132 BC. Harsiese, having helped himself to the funds of the royal bank at Thebes, fled the following year. In 91 BC, another revolt broke out. In the following years Thebes was subdued and the city turned into rubble. During the Roman occupation (30 BC-349 AD), the remaining communities clustered around the pylon of the Luxor temple. Thebes became part of the Roman province of Thebais, which later split into Thebais Superior, centered at the city and Thebais Inferior, centered at Ptolemais Hermiou. A Roman legion was headquartered in Luxor temple at the time of Roman campaigns in Nubia. Building did not come to an abrupt stop, but the city continued to decline. In the first century AD, Strabo described Thebes as having been relegated to a mere village. Great Temple of Amun at Karnak (Ancient Egyptian Ta-opet), still the second largest religious building ever built, is the main house of worship for Amun, Thebes' patron deity, and the residence of the powerful Amun priesthood. What differentiated it from the many temples of Egypt is the length of time it was built over (more than 2,000 years, starting in the Middle Kingdom). The main features of this temple are its ten large pylons, the Great Hypostyle Hall, a sacred lake, sub-temples, numerous shrines and multiple obelisks. It was the most important temple for a majority of Ancient Egyptian history. Luxor Temple (Ipet resyt), unlike the other temples in Thebes, is not dedicated to a cult god or a deified version of the king in death. Instead it is dedicated to the rejuvenation of kingship; it may have been where many of the pharaohs of Egypt were crowned. It is a centerpiece of the "Opet Festival", where the sacred barque of the Theban Triad travels from Karnak to Luxor temple to highlight the godly significance of the re-coronation of the pharaoh. ↑ Also rendered as Hundred-Gated Thebes. ↑ Pausanias records that owing to its "connection" with the Egyptian city, the Boeotian Thebes also had an idol and temple of Amun from the 5th century BC. ↑ Iliad, IV.406 & IX.383. ↑ Description of Greece, IX.16 §1. ↑ George Modelski, "Cities of the Ancient World: An Inventory (−3500 to −1200)"; see also list of largest cities throughout history. ↑ Karnak (Thebes), Egypt. Ancient-wisdom.co.uk. Retrieved on 2013-07-29. 1 2 3 Egypt: Thebes, A Feature Tour Egypt Story. http://www.touregypt.net/. Retrieved on 2016-02-06. ↑ Wilkinson (2011), pp. 188 ff. ↑ Margaret Bunson, "Encyclopedia of Ancient Egypt"
↑ Tyldesley, Joyce. Egypt's Golden Empire: The Age of the New Kingdom, pp. 18–19. Headline Book Publishing Ltd., 2001. 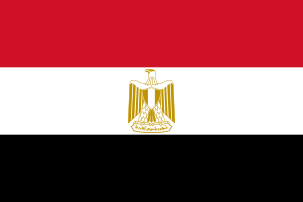 ↑ Egypt: Ramses the Great, The Pharaoh Who Made Peace with his Enemies And the First Peace Treaty in History. http://www.touregypt.net/. Retrieved on 2016-02-06. ↑ RAMESSES III: THE LAST GREAT PHARAOH. http://www.greatdreams.com/. Retrieved on 2016-02-06. ↑ The fall of Thebes to the Assyrians and its decline thereafter. http://www.reshafim.org.il/. Retrieved on 2016-02-06.